← DUKE: THE 2010 NATIONAL CHAMPIONS! Also, K’s current stand at 868 career wins puts him in a position to become the all-time leader in NCAA wins in a matter of years. If he gets 35 victories next season (which means we’d be in the Final Four again), he could pass Bobby Knight’s 902 wins. Additionally, Coach K will likely pass Dean-O’s 879 wins by December. Got em! Ayo dis John Wall. I mean I’m nice at ball…but I don’t have a RING like Jon Scheyer. Jake: I was wondering if you knew anything about the status of Kyle Singler…. Will–we’re coming out with a big Singler post soon and will talk about his NBA chances. Wooden actually had to win 4 games to win all but one of his titles. For his last championship in 1975 UCLA had to win 5 games. 75 was the first year the tournament expanded to include 32 teams. Before that the field was somewhere between 22-25 teams. Still, winning is winning and you can’t argue with 10 championships. I think there is a good argument though that K’s sustained excellence in the modern era with a much deeper tournament field deserves to be considered somewhere in the same ballpark as what Wooden did pre-March Madness. Hey Colin, thanks for the fact checking. That’s a good point. And by no means was I saying that Wooden doesn’t deserve his G.O.A.T. status—10 titles in 12 years is beyond anything anyone has done, arguably in any sport. I just wanted to use Wooden as the highest benchmark to aspire to. And K is probably the next most accomplished coach in CBB history along with Rupp. 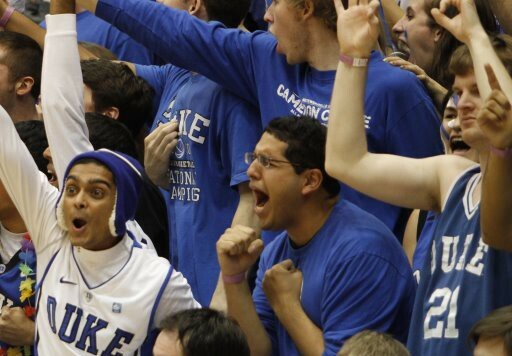 By the way, I graduated from Duke 10 years ago and I really appreciate this site. It is nice from an alum’s perspective to have a fan site run by current students. Keep up the good work!